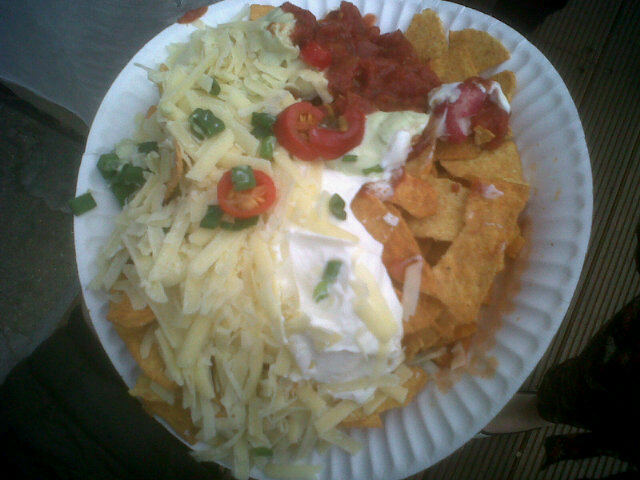 Jordan of the brilliant Horrid Movies site recently informed me of a Horrid Nachos Experience (HNE) suffered on a paper plate and involving a radish. I’m as up for innovative nachos as the next hombre, but this is ridiculous. As the well known Chinese proverb says: It’s all fun and games until someone gets a radish out. Yes, there’s cheese. I mean it’s quite a good proportion of cheese actually (if not melted) and yes the proportion of guacamole, soured cream and salsa is vaguely accurate despite, as always, a slight paucity of the latter. But hang on. There’s a radish there. “It was really weird,” Jordan recounted earlier today, “as I was about to go, the woman was like: ‘don’t forget your radish’ and started chopping one up.” Camden is renowned for it’s kookiness, but this is going a bit far. One overly zealous attempt at livening up a promising plate of chos with an incongruous vegetable barely used in any meals, let alone those of mexican descent, and it’s over. It’s all over. Camden market gets points for trying, but sadly they pushed it one step too far. In the direction of Beatrix Potter.